The crowd lining Southampton docks cheers as the refugee ship noses into port. The battered old liner is low in the water, its bilge pumps spewing furiously, and its decks are packed with small bodies, waving arms, two or three faces squeezed at every porthole, boys hanging half-out in their relief and apprehension. Four thousand children on a ship designed to carry eight hundred, spilling now down gangplanks, clutching duffel bags and the hands of their siblings, many bewildered and tear-stained, smelling of urine and vomit. The voyage has been two days and nights of storm-tossed, sleepless terror, of clutching and praying and sobbing for mothers who have been left far behind. But waiting for them on the dockside this beautiful Sunday morning in May are kind-faced doctors with cool hands and the familiar scent of tobacco on their coats, shiny-faced ladies in starched uniforms wielding towels and blankets, and – behind a makeshift cordon (no-one expected such a turnout; people were asked not to come, but come they have) – ordinary people, English people, mums and dads and their kids, grannies and vicars and dockworkers, come to welcome the refugees, to show the poor war-torn mites they are safe now, among friends, somewhere the bombs and bullets cannot find them. These are well-wishers, the good hearts of Hampshire, and they sing, and clap, and beam smiles of warmth and comfort as the dark, anxious faces stream by. There’s a camp nearby, row after row of sturdy white tents waiting; a canteen and a hospital, running water and latrines, and heaps and heaps of donated clothing, food and supplies. The children have never camped before, and the enthusiastic volunteers, the Girl Guides and the VADs and the Boys’ Brigade, do their best to make it seem like a fine adventure for them all. The government hadn’t wanted them to come. The newspapers warned against accepting them. The Foreign Office had very nearly refused permission, even as the packed ship was preparing to set sail. But these lucky children had a champion, a warrior who persuaded both heaven and earth to budge, to favour their cause – and who would continue to fight their corner for the next two years. Leah Manning is the very last to disembark, carrying in her arms a child too ill to walk, and it will be dusk before she reaches the camp where she too will live for the next few months. But Mrs Manning is not the only champion these children have. She and her Committee have mobilised support from around the entire country, giving talks to WI groups, trade unions, churches; gatecrashing society dances, holding auctions and fêtes and lectures; insisting that though these might be people with a different culture, a different language, they are the same as us in all the ways that matter; offering reminders to a nation that still remembers all too well what war does to families. This was 1937, when a shipload of Basque refugee children fleeing the Spanish Civil War found brief sanctuary here. Their ca re was organised and paid for entirely by private effort and donations; not a penny of state aid was forthcoming. The government refused even to waive the hire fee for the tents. 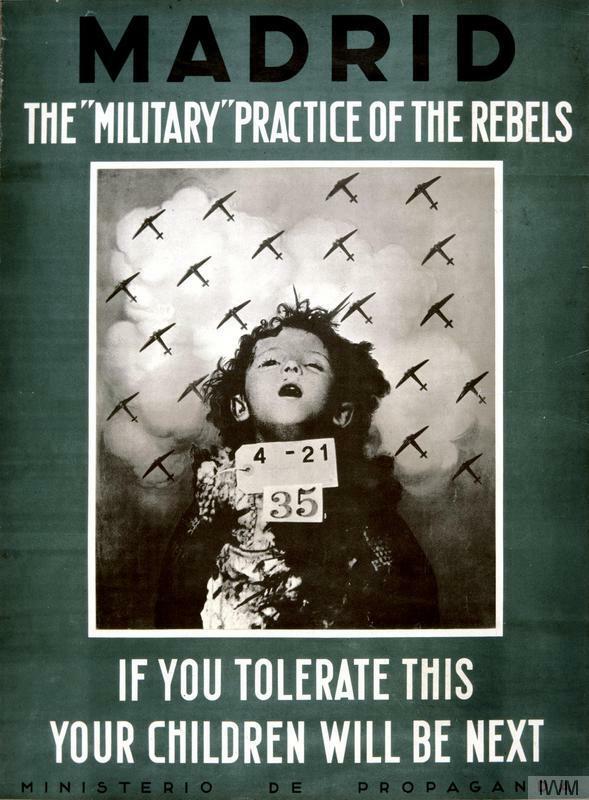 Then, as now, the image of a dead child was one of the things that helped mobilise public opinion. Guernica, San Sebastian, Bilbao – the Basque Country fell soon after the evacuation, and then Franco demanded the children be returned. The political pressure eventually became too much even for the doughty Mrs Manning. By Christmas 1938 all but 200 had been ferried back and handed over at the border, even though for many there was no-one and nothing awaiting them but famine, brutality and the pitiless orphanages of the Falange. Some of the older boys escaped over the Pyrenees, through France and back into Catalonia where the Republicans still held out against Franco, but what chance did a ragtag army of volunteers and adolescents ever stand against the well-trained forces of the Spanish military and the bottomless ordnance of both Germany and Italy? By the end of 1939 all was lost, and the exodus began. 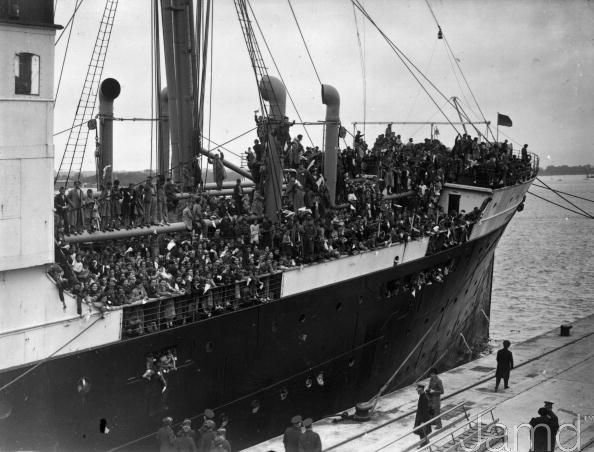 But unlike in 1937, no warm smiles, no relief or succour, awaited the Spanish refugees this time. 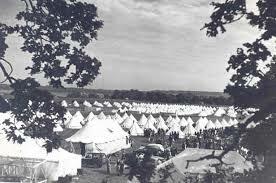 After two days the French closed the border, but the refugees kept coming, until they were packed so tightly at the barrier that ‘one would have to walk on their heads to get across,’ as one English volunteer put it. Strafed by machine-gun fire as they fled through the mountains, the exhausted families were bleeding, crippled, freezing, starving. Their bodies strewed the mountain paths, and eventually the French relented. 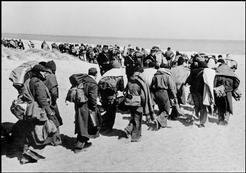 The border was opened, and the refugees were escorted by the army onwards: to the barbed-wire pens on the beaches of Argèles-sur-Mer, where freezing sea and icy sand were all the amenities they would find, and where they would be put to work building their own concentration camp. 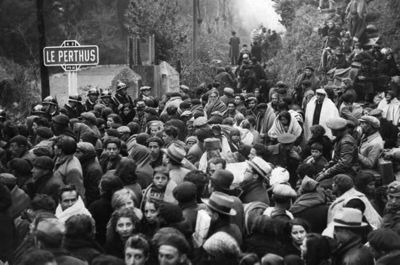 More than 500,000 Spanish refugees flooded over the Pyrenees and into France in just a few short days after Spain fell to Franco. Of these, 100,000 were placed in the Argèles camps, the rest in camps elsewhere. Those without sponsors or independent means, the vast majority, remained in the camps they built themselves until the Germans arrived, when bad conditions became considerably worse. Some survived until the end of the war; very many did not. Of those who did, very few returned to Spain until after Franco’s death in 1975, living the rest of their lives in bitter exile. The children and grandchildren of those exiles claim as their heritage a Spain that was never more than a dream. “Between his eyes, there were four lines, the marks of such misery as children should never feel. He spoke with that wonderful whisky voice that so many Spanish children have, and he was a tough and entire little boy.” – Martha Gellhorn, on meeting a young survivor of the French camps. This is the background to the novel I have been working on for the past two years, and moved and distressed as I have been by the many heartrending accounts of courage, horror and grief, my research was the more bearable for knowing that these events were 75 years distant from my loved ones and me. That they were history, documented, well-known; the source of outrage and sorrow, exhaustively analysed: lessons from the past that had surely been learned. But in the last few weeks, witnessing the terrible scenes in Europe, the border battles in Hungary, the tides of desperate people overwhelming Germany, it has become clear that history does not teach those kind of lessons. It is doomed to be repeated regardless. Nations are like corporations: they act without conscience for the short-term interests of their stakeholders. But human beings have an endless capacity for compassion, courage, generosity and kindness. And if there is any light to be found in the awful catastrophe unfolding on the Continent, it is that so many have responded with their hearts to the plight of their fellow humans: volunteering, demonstrating, donating, sharing – acting on that powerful urge to help, to DO SOMETHING. We are lucky enough to live in a country where our speech is not proscribed, where our leaders are democratically elected, and where our ability to help is not curtailed by law. We have a responsibility as individuals to make our collective will known, by adding our voices, extending our hands, opening our homes.. Politicians cannot be allowed to decide who deserves our compassion and who does not. Volunteer. 38 Degrees have created a ‘National Refugee Welcome Board’. Visit #RefugeesWelcome for info on local campaigning groups, fostering or adopting refugee orphans, housing. Social Media. Such a huge, huge gift for changing hearts and minds, as we have found out in the last few weeks. For every Britain First post you see, share two from Hope Not Hate or the Wordwide Tribe… Don’t let hateful comments stand unchallenged. Campaign. Add your voice or volunteer to help. 38 degrees, Avaaz, Sum of Us – sign everything. Then share on Facebook/Twitter/Instagram/wherever you have homies. Spread the love, spread it, because we can and we must. This entry was posted in Musings and tagged basque children, refugees. Bookmark the permalink.